Every animal has its place in this world. Every animal has its right to live. So does a chicken. If needed to be bred for food, then at least they should be bred humanely. Free range is the way to go, where the chickens are free to roam the plains and live the way they would want to live, well yes in certain confined parameters, but who doesn’t live in such parameters, even us do. Anyway back to the chicken, so have you ever thought about those chickens cooped up in a tiny cage barely enough for them to stand straight all their live and then slaughtered for food? How can one eat an unhappy chicken? In fact does the chicken even know it is living? In light of current movements where we start to understand where our food comes from, and we start to care where and how it comes to right in our plates, then definitely we need to know that even if those we consume are in the food chain and in course with nature, we should at least have done that in most humane way as possible. Even animals killed another animal with grace (mostly), and so we should likewise have done the same, be it we hunt them or more ubiquitously now in modern times where we rear them. So here I introduce to you about a company called Sunshine Chicken (how apt!) with a heart that owns a 15 acre farm up in the highlands of the outskirts of Kuala Lipis, Pahang. Although a fairly new company, they had definitely started on the right foot in my own humble opinion, where they retain a sort of kampung (village) environment of lush green fields and fresh clean air as their setting for free range chicken farming. Here is sort of like chicken utopia, where they are allowed to live almost freely as animal. According to Sunshine Chicken, “Happy Chickens makes tasty chickens! Stress free means toxins free, makes our chickens taste more like chickens and less like something manufactured. “ . Also one key point to note was that they fed their chickens the natural ma cho, which literary translates as horse grass, it is well known in our Chinese community for its good natural properties. Even at home, J’s mum plant ma cho for own consumption, where she would boil the stalk parts for a refreshing drink! It tasted like light sugar cane water minus the whole load of sweetness. If you think this has already been special enough, wait till you hear about the castrated chickens. That’s right, castrated, and which they are also known as a Capon. According to my favourite information site online, the Wikipedia, the castration produces a unique type of poultry meat where the male would accumulate more body fat and in overall often to have more tender, juice and flavourful meat in comparison to a normal chicken. Being a tham jiak, and having a huge good bunch of foodie friends, allowed me to explore this wonderful happy and fatty too in some, chickens, where indeed it was seriously tastier, I kid you not. Thanks to Babe in City – KL and Gerald, who organized this great outing and for inviting me to it. As we can read at babe’s blog, we all have gathered at Kedai Makanan Chef Tam in Selayang, I got there easily thanks to my GPS. Here we were served with both the aforementioned special chickens. We had the ma cho kai roasted deep fried and then hung to dry. Indeed such a unique preparation that had most of us thought roasted, no wonder it had such crispy skin yet do not taste oily at all! Thumbs up to the chef! 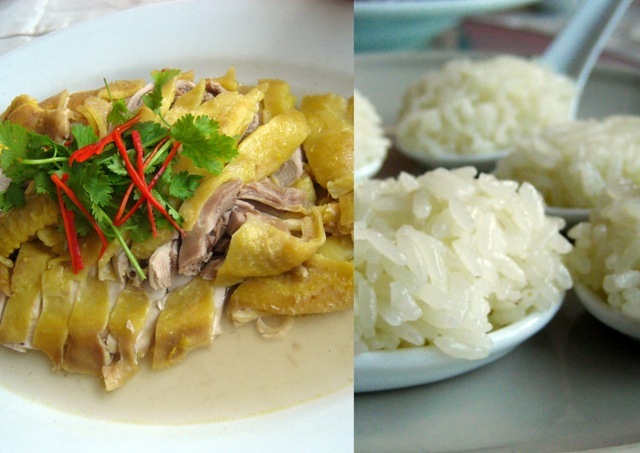 As for the capon, we had it at its natural best, where it was just simply steamed with some salt – steamed yim kai. And for this, I may so attest to what had been explained by dear Wikipedia, it has a superb texture which is toothy yet juicy! With accompaniment of the minced ginger that pack a punch and a flavourful soft rice that was cooked with the steamed chicken broth, I swear I could eat just these as a meal itself! But apart from the chicken being the main thing of the entire affair, somehow the seafood does take a piece of their own 15 minutes of fame. 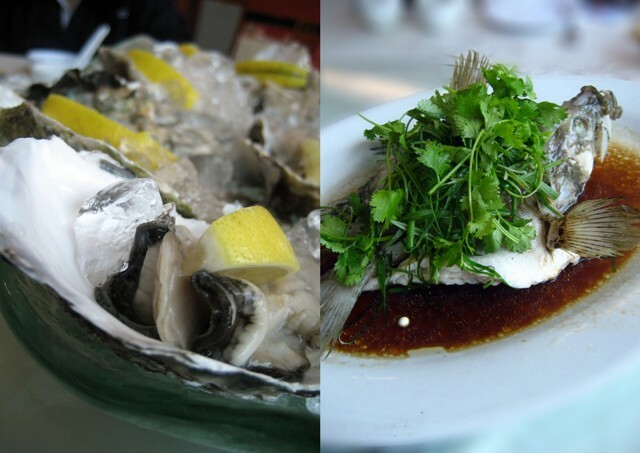 With fresh seafood sourcing directly from their famous neighbour Jin Chwan Seafood Garden, we get to eat the fresh, plump and creamy oyster which was one of those rare ones that does not have the sang mei (the sort of metallic taste that you get when eating seafood that are not fresh). We also had the steamed Garoupa from Sabah which was in another of Chinese simplicity to present the best out of the fresh fish. 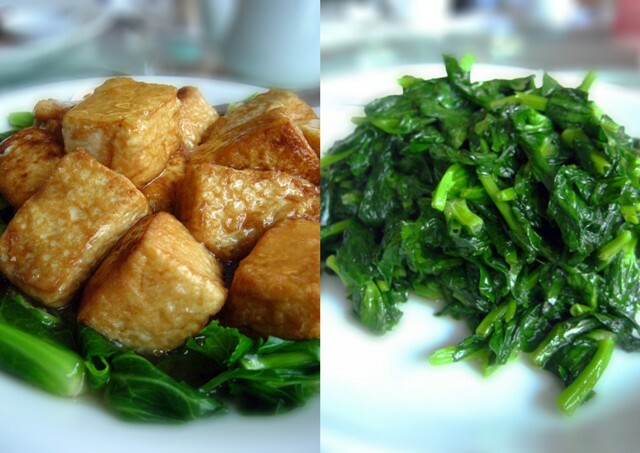 Also to accompany our meal, and also to probably clean our palate from all those indulging food, we have the tofu and the stir fried green vegetable. I really liked the tofu where it was fried to create a ‘casing’ that gave a light crunch before you get to the smooth silky part. I truly enjoy this humble dish, which may actually be not so humble anymore judging the skill needed to prepare it. This meal has truly been eye opening, I learnt a lot that when one cares where does the food comes from, be it free ranged animals to live fresh seafood, it does wonders to the end product of the dish. Like the philosophy I hold to when it comes to cooking, get the best and freshest ingredient, half the job has already been done to make the dish good even before you cook it. Therefore, try free range chicken if you want to cook up a feast, you may get them from Sunshine Chicken through these places or contact Gerald if needed. As for those who would like to savour them with skills of a chef, I would certainly recommend you to try out Chef Tam’s.